Take it easy on Friday and Saturday, the event we’ve been waiting all year for is Sunday! Get your weekend started with a little acoustic rock and folk music and a whole lot of great beer. Sheehan & Holden will be playing original music as well as classic covers from Petty, DMB, the Black Keys, and more…be at Bissell Brothers starting at 5:30! Gross and The Real Samuel James will be performing their monthly Blind Song Trade at Blue, starting at 8 pm! Listen as they come up with a spontaneous theme onstage and trade songs accordingly, never breaking from the theme. Ahh… The calm before the chaos. Go have a listen to Dan & The Wildfire, one of Boston’s hottest up and coming acts, at another Urban Farm Fermentory Afternoon Acoustic sesh, starting at 3 pm. Pre-game for St. Paddy’s Day as the A-Beez get you moving and grooving at the Thirsty Pig starting at 6 pm… And while you’re at it, a really good sausage and beer never hurt anyone. Kick off your St. Patrick’s Day celebrations with a plunge into the ice cold waters at East End Beach! This plunge has raised funds for the Portland Firefighters Children’s Burn Foundation for the last 17 years. Ri Ra will open their doors at 6 am for a complimentary Irish Breakfast for those taking the plunge! PS… The plunge is followed by non-stop fun all day long at Ri-Ra, featuring back to back musical performers, the Plunge Raffle, shenanigans, and more! Irish or not– 6 am means it’s time to party, and that’s exactly when $3 Dewey’s will open for shenanigans. With live music from Dave Mello and Level 7, you don’t want to miss it! Experience the luck of the Irish at Gritty’s for one of the wildest days of the year! They’ll have brunch starting at 6 am, plenty of stout on tap, a special St. Patty’s day menu, cool swag, bagpipers, and more! The first three chances of some great craic with Maine’s best Irish Pub band. It’s tea, bacon sandwiches, pints of stout, and a few tunes and songs with The Napper Tandies, an auspicious way to begin your St. Patrick’s Day revelries, starting promptly at 8 am at Brian Boru. The Thirsty Pig? You can call it the Lucky Pig for the big day. 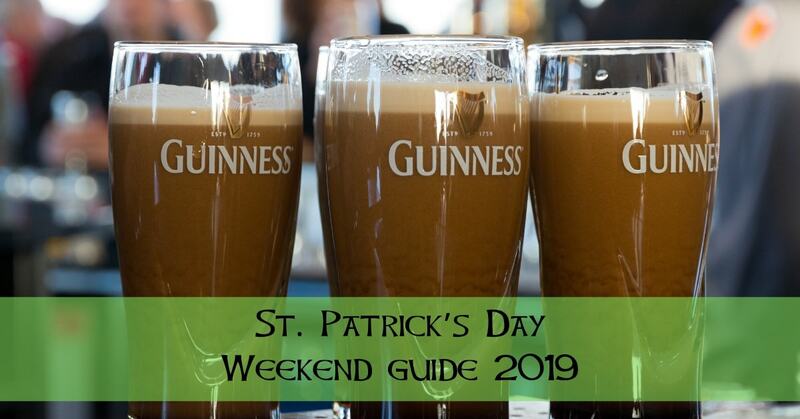 Irish Breakfast with Bangers and Mash, Corned Beef and Cabbage, and all the classic Irish beverage favorites start when the doors open at 11, and don’t forget to get your face painted! Join Fore Play for a St. Paddy’s Day party that will sprawl over two floors, with a DJ on each one, crazy drink and beer specials, and the best Jello shots around, starting at 11 am. This St. Patrick’s Day, Bunker Brewing Co. is opening early at 11 am for live music, beer, and food! Listen to Boghat play some Irish tunes, eat yummy food by Grillin’ Brazilian (Irish themed specials, of course), and plenty of Dry Irish Oatmeal Stout on nitro. Beginning at noon, don’t miss the epic St. Patrick’s Day Parade through the Old Port, brought to you by the Irish American Club of Maine. Bagpipes, and shamrocks, and Irish flags, oh my! Join Novare Res for some special beers and eats, right on theme with fresh Irish stouts and red ales, soda bread and whiskey gravy, and Irish Goodbye Beef Stew, starting at noon! What’s the best way to describe St. Patrick’s Day at Liquid Riot? Local. They open at noon for lunch and drinks and a post-parade, locally-made Irish celebration.